Stronger is better. Period. Regardless of your fitness goals, becoming stronger will always help performance. Whether you want to increase performance in a field sport, weightlifting, powerlifting, or you just want to be able to move better as you age, increasing your ability to efficiently generate and apply force (strength) will help you reach those goals. So how does this happen? Why do our bodies get stronger and how do we generate this response? In this article we will examine some of the physiological processes that take place in response to effective training and its basic principles to ensure we are getting the most out of our hard work in the weight room. Volume: the amount of sets and reps done for a particular exercise, workout, or full strength cycle. Intensity: the amount of weight being performed. Load: “intensity x volume” is one way to calculate the the overall training load over a set period of time. Adaptation: strength gains in response to training stimuli. Motor Unit: the combination of a motor neuron and all of the muscle fibers it is connected to. There are the two primary physiological components at play when we make strength adaptations; neurological and structural (morphological) adaptations. Structural adaptations are physical alterations to the cross sectional area of the muscles (hypertrophy), as well as strengthening of the bones and connective tissues (Everett, 2016). For building strength, myofibril hypertrophy is the key structural change that drives strength performance. Myofibrils are the contractile components of a muscle made up of sarcomeres which are comprised of sliding filaments called myosin and actin. When we experience myofibril hypertrophy as a result of strength training, we are seeing an increase in the number of myofibrils within the muscle, therefore creating much more contractile force potential within that muscle. Neurological adaptations occur when our body becomes more efficient at using and recruiting muscles we already have. By continuously exposing ourselves to heavy weights, we improve our body’s ability to recruit and synchronize the body’s motor units. (Aita, 2018). This is the primary way strength athletes build strength and power over the long term. This is also why you see athletes who are smaller in stature display remarkable feats of strength without gaining weight (Everett, 2016). Watch weightlifting in the Olympics some time and you will see some of the most neurologically efficient athletes on the planet. There are several types of neurological adaptations: the increase in the number of muscle fibers recruited within a particular motor unit, an increase in the frequency of a motor unit’s activation (rate coding), and the increasingly synchronized activation of motor units. In summary, within a particular muscle, the more muscle fibers that are recruited in a synchronized fashion at a high frequency, the more contractile force that muscle will be able to produce. The absolute foundation of strength training is laid out in Hans Selye’s General Adaptation Syndrome (GAS). Selye was a Canadian endocrinologist from the early 20th century and first described GAS in his 1956 book, The Stress of Life. To summarize, GAS states that systems will adapt to any stressors they might experience in an attempt to meet the demands of these stressors (Selye, 1984). For our purposes, strength training is the stressor that our bodies adapt to. There are four phases in the GAS (Figure 1): Homeostasis, Alarm, Resistance, and Exhaustion. Homeostasis is where our body is at an equilibrium and functioning optimally, Alarm is where the stressor is introduced (training), the Resistance phase is when our body adapts to the stressor to a greater level than that of the stress (super-compensation), and Exhaustion is where the frequency and magnitude of the stressor have exceeded the organism’s ability to adapt (over-training). This is the basic outline of how any living organism responds to stress; that includes human beings and their response to the stress of strength training. After analysis of these principles, we can conclude that for there to be strength adaptations, there must be a disruption in homeostasis. 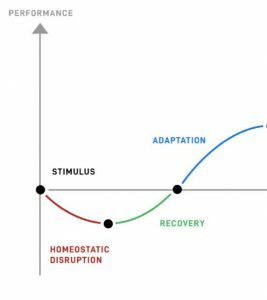 In order for this disruption to take place there needs to be a new training stimulus (increase in intensity/load over time) significant enough in both magnitude and frequency to cause the disruption. This takes us into the alarm phase where we see a temporary drop in performance and training capacity. This triggers the body’s physiological responses to resist (phase 3) and overcome the stress so that the body is prepared for that stressor in the future by overcompensating to a level greater than the stress that was just introduced. Lastly, in order to avoid exhaustion/over-training (phase 4), there needs to be adequate recovery time and methods (i.e. deload periods, nutrition, sleep) that take place to allow the body to return to homeostasis in an overcompensated (stronger) state. A very common mistake for athletes and coaches to make is to continue to apply the same training stimulus, with no changes in intensity and volume, therefore not affecting the training load in a way that puts the athlete into the stress/recover/adapt (SRA) cycle. If there are not strategic manipulations of volume and intensity over the course of a training cycle, based on the athlete’s current level of strength performance, the athlete will not be able to consistently progress through the SRA cycle (figure 2). The accumulated effects of the workload over time produce the adaptation. If this is not managed correctly, training will be less than optimal. If it is not managed at all, we are not training. We are merely exercising (Rippetoe, 2013). The concept of progressive overload is directly tied to the GAS. The GAS is the biological theory that makes progressive overload work. Once the body has adapted to a certain type and magnitude of stress, it will maintain that accommodation for as long as it is exposed to that stress on a regular basis (Everett, 2016). In order to stimulate continued strength gains, the athlete must be exposed to unfamiliar stress. For strength athletes, the unfamiliar stress that is our primary concern is intensity. In order to get stronger, we must progressively lift heavier weights over time. This is the progressive overload principle and it cannot be neglected when designing and managing a strength program. It is alarming how often I have seen this principle overlooked. In addition to the progressive overload principle, there must be some variance in training. Variance within a strength cycle, as well as variance between different cycles. If you only consider the principle of progressive overload but continuously do the same exercises, with the same rep schemes, with the same loading schedule, from week to week, month to month, and/or cycle to cycle, progress will stall. This unwelcomed phenomenon is called “adaptive resistance,” which means your body will no longer make adaptations if the same stimulus is applied too often. Here are some simple examples of ways to create more variance in your training: plan training blocks within your program where each block has different accessory exercises, if your intensity progression in every workout is strictly linear, try incorporating some wave progressions, or you could do some phasic training with pauses and eccentric movements in your lifts. Let’s be clear, the concept of progressive overload does not mean you should just continuously increase the intensity of your workouts with reckless abandon. The application of new stressors and increases in intensity need to be strategically managed in order to mitigate the negative impacts of fatigue. Fatigue is defined as the “reduction in the ability of an athlete to perform as specific task.” (Aita, 2018, pg. 8). If all we do is continuously increase the training load, the favorable adaptations will stop, the athlete will plateau, and eventually we’ll see a decrease in performance and/or injury. There must be periods of deloading within a training cycle in order to let the athlete effectively work through the SRA cycle. Referring back to the GAS, this is how we avoid the exhaustion/over-training phase (phase 4). The frequency and length of the deloading period will depend on the developmental strength level of the athlete. A detailed analysis of the different developmental strength levels and how to train athletes within each one will be a topic for a future article; however, I did touch on the topic briefly in this article. There is certainly more than one way to “skin this cat.” There are a variety of effective strength programs out there that have been designed by a variety of different strength coaches who adhere to various philosophies. Despite these different approaches however, all of the preceding principles discussed here are adhered to in every successful program. If any of these principles are neglected in a strength program, training will either be less than optimal or just flat out ineffective. A program must be designed and managed in such a way that it is developmentally appropriate for the athlete’s level of strength to allow them to efficiently and effectively move through the SRA cycle. If there is too much variance, then you are violating the principle of specificity, and vice versa. If you are too aggressive with the progressive overload, then you are violating the principle of fatigue management, and vice versa (Attia, 2018). It is a delicate balance that requires understanding of these principles, as well as experience applying them. Before investing too much of your time, money, and energy into a program make sure you understand these principles and make sure your program adheres to them. Best of luck in your pursuit of strength. Aita, M. (2018). Strength development for weightlifting. Laguna Niguel, CA. Juggernaut Training Systems. Everett, G. (2016). Olympic Weightlifting: A complete guide for athletes and coaches (3rd ed.). Catalyst Athletics. Rippetoe, M., & Baker, A. (2013). Practical programming for strength training. Wichita Falls, TX: Aasgaard Company. Selye, H. (1984). The stress of life. New York: McGraw-Hill.